Photos by Jenny Neyman, Redoubt Reporter. Tim Marsh creates light and dark shading in the reading area carpet with his vacuum cleaner, depending on which way he pushes the carpet knap. Renoir and his paintbrush. Michelangelo and his chisel. Ansel Adams and his camera. And now, Tim Marsh and his vacuum cleaner. Though Marsh, of Soldotna, isn’t as famous as these art masters distinguished throughout history, his fans are every bit as adoring of his creations. “The kids love it. They’re excited to see what he drew, to try to guess what it is. Some kids will stop by in the morning before school to go look at what he did,” said Bobbie Baldwin, teacher and librarian at Redoubt Elementary School in Soldotna. Photo courtesy of Tim Marsh. 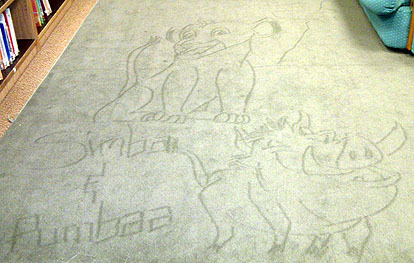 Tim Marsh, custodian at Redoubt Elementary School, created this design of Simba and Pumba, characters from, “The Lion King” in the library at the school. He creates a new design every day in the green carpet students sit on for story time in the library. 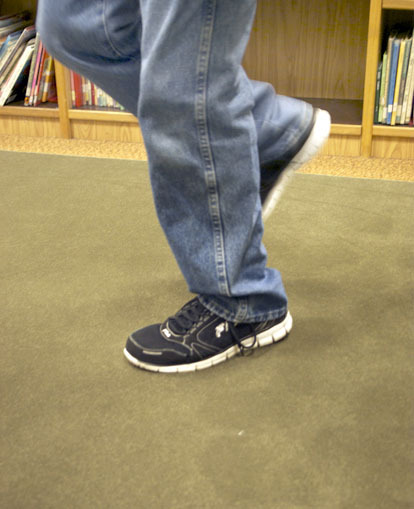 Marsh’s medium is a 9-by-12-foot patch of green, low-knap carpet in the story time area of Redoubt’s library. On it he spends five or so minutes a night creating fanciful renderings — dinosaurs, wild animals, characters from books, holiday scenes and many more — with nothing more than his vacuum, a stick, his feet and his imagination. “All these little tricks I’ve come up with carpet. Who knew, right?” Marsh said. Marsh has been working at Redoubt for four years, by way of Kodiak, Montana, growing up in Wyoming and being born in Anchorage. About two years ago he was going about his nightly cleaning duties as usual, when he noticed something about the patch of carpet the kids sit on for story time in the library. When he ran his vacuum over it, drawing the knap one direction or the other, the appearance changed from light green to dark green. There can be an element of the monotonous in a custodial job — same thing, day in, day out — and the novelty piqued Marsh’s interest. He started experimenting with the possibilities of his discovery. “When I first noticed it I just started making checkerboards, triangles, things like that. And then I thought, ‘I’ll make it fun for the kids,’” Marsh said. A lion crouches in front of an elephant. So he started “drawing” into the carpet. Sometimes just general scenes, or holiday-related if Christmas, Valentine’s Day or the like were near. Then he started asking the librarian what books she was reading to the various classes, and drew characters, creatures or scenes to go along with a book. “And the story was, when the kids come in and sit on the carpet and the librarian starts to read the story to them, Redoubt’s magic carpet brings them into the story,” he said. At first the pictures were a novelty. He started last year, and has created a fresh piece of carpet art every school day he’s been at work since. It’s still exciting, but novelty has changed to expectation. 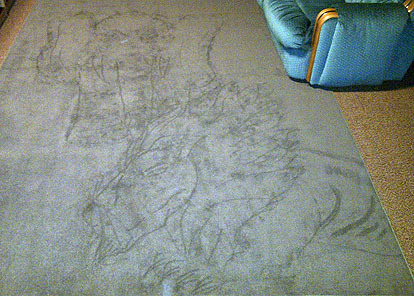 “The last sub I had, the sub called and said, ‘You didn’t tell me I was supposed to draw on the carpet. All the kids came running up to me asking why I didn’t draw a picture on the carpet. I didn’t know what they were talking about,’” Marsh said. It’s become part of the library’s character. In the morning, teachers stop by to check out the carpet. Kids pop in before class to get a look, too — careful not to walk on the design. Now when classes go to the library, there’s a certain protocol to be followed. Baldwin has them form two lines in the hallway. “I step out into the hall and I say, ‘We have carpet art today,’” Baldwin said. She ushers one line of students in to see the carpet, then has them stand back against the checkout desk while the other line comes in to see it. Only then do the kids sit down on the carpet for their story. Except every once in a while, a design will be so good Baldwin doesn’t want it disturbed by the first class of the day — particularly if it relates to a book that will be read to a class meeting later in the day. In that case, story time is seated elsewhere. Students love guessing what the drawing is, Baldwin said. Though the images are quite elaborate, the medium is carpet, after all, and not capable of exactingly fine detail. It doesn’t bother Marsh if his masterpieces are occasionally misinterpreted. As long as the kids are having fun, he’s happy. “The kids can sit on the carpet and they can come up with whatever they want. Whatever story they come up with that makes them happy, that’s what it is. And some kids will come up with something way different than what I thought I drew. But I’m like, ‘Yeah, I can see it,’” Marsh said. A pterodactyl perches with wings outstretched in a tree. On a recent evening Marsh knew the librarian would be reading a book about dinosaurs, so set about to draw a pterodactyl. 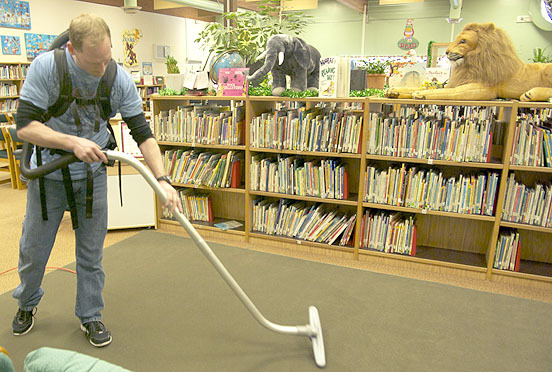 He began as he always does, by erasing any remnants of the previous day’s artwork and footprints by running his vacuum — a backpack unit with a long, handheld wand — across it, making several passes over the spots where detail had been set particularly deep. Then he created a clean canvass by pulling the knap all the same “light” direction. He took a moment to ponder the design. “I used to be able to come in here and just stare at the carpet, see the shadows in the carpet and the picture comes out in the shadows,” Marsh said. He set to work, taking a long swipe with the vacuum wand here, making short little strokes there, strategically turning parts of the carpet from light to dark. First emerged some outstretched wings, then a head and body. Marsh scuffs his feet on the carpet to create the look of tree leaves. 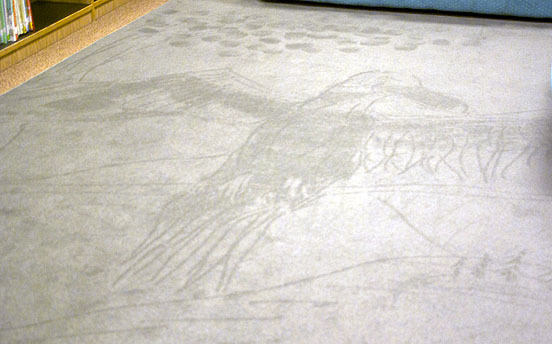 Next he picked up a long wooden dowel, repurposed for carpet artistry, and starting etching in details — talons, eyes, mouth and texture on the wings. After considering for another moment, he decided to perch the prehistoric bird in a tree, so drew branches and a trunk, then leaves by scuffing his feet into the carpet. Then he added mountains in the background, and declared it finished. Marsh rated the drawing as a four out of 10. He can render the outline and shapes of most anything, he said, but fine detail is a challenge. “I can do pretty much anything I want. But I can’t do anything 3-D, since it is a carpet. I can only go so far with only light and dark, depending on the way you move the knap on the carpet. I can draw a figure and try give it some eyes and details, but you’re not going to get 3-D shading out of a carpet,” he said. Some of his creations far overreach the expected limitations of the medium. 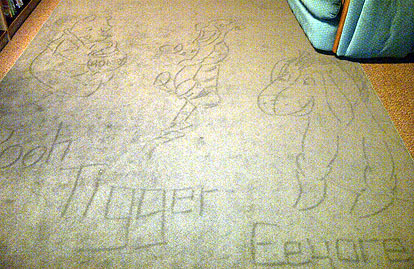 He drew one scene of Eeyore and Tigger from “Winnie the Pooh,” and another of a standing elephant with a lion lying in front of it that are his favorites. Marsh took art classes in junior high and high school and always loved to draw, he said. Redoubt’s magic carpet has given him an imaginative outlet, for both he and the students. And the possibilities are endless. “The kids have a lot of good ideas, and they don’t read all the same books all the time. There’s lots of books in that library,” Marsh said. But there’s only one magic carpet in Redoubt. “There’s other carpets in Redoubt I could do this with, but it doesn’t work. There’s just something about the color of this carpet that I’m able to draw the knap one way and another way. It’s the only carpet in the whole school I’m able to draw pictures on,” he said. Baldwin had no idea of its special properties when the carpet was purchased. “It was a very inexpensive carpet that we got probably at Lowe’s or Home Depot because it cost less than $100. It was not an expensive carpet, but now we wouldn’t part with it unless we had one just like it,” Baldwin said. “We love for the library to be an engaging place for students, and Mr. Marsh’s extra effort on behalf of our library students is just one more exciting thing that happens in the library,” she said.